For my first blog giveaway, I want to give a 1 hour social media training to the Hillel thatВ receivesВ the most mentions in the comments of this post. I want to give back to where I was inspired to become a social media blogger. My first job out of college in 2010 was working for Towson Hillel as the Director of Engagement. I learned how to use social media to engage with students and manage an online community. Human interaction is a lot like social media; answer questions when people ask them, engage in exciting conversation and be true to yourself. 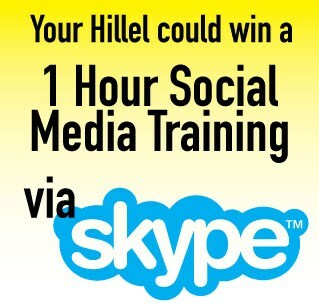 Two Hillels will win a free 1 hour social media training via Skype for students and/or staff. I have previously held a Google+ Hangout for Hillel Professionals where we talked social media strategy. 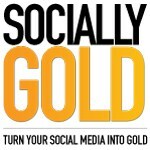 – Like SociallyGold on Facebook and post on the wall why your Hillel should win. 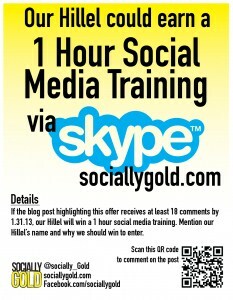 If your Hillel receives at least 18 comments on this post by 1.31.13 and why you should win, you will automatically earn a 1 hour free social media training. Click the image below to download the flyer that you can post on social media and in your Hillel.